A few passing clouds. Low around 55F. Winds S at 10 to 15 mph. Durl grew up on a farm in Kansas. He worked with his mother, father, grandmother and siblings to help the family make a living during the Great Depression and Dust Bowl years. He attended a one-room schoolhouse, participated in Christian Endeavor, and was a 4-H member. Durl began his 45-year career as a baker at Meyers Bakery in Atchison. 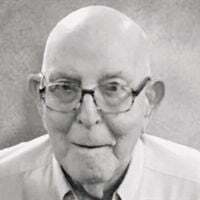 After serving in World War II from 1941 to 1954, Durl worked in bakeries in Selina, Kansas, Ames and Marshalltown before purchasing a bakery in Knoxville and opening the Royal Pastry Shop where he made cakes, pies, cookies, and bread for 24 years. Making beautiful decorated cakes for weddings and other special occasions was his specialty. He served his profession as the president of the Iowa Bakers Association for two years. In retirement, Durl documented through video and photography hours of his grandchildrens lives when attending their sporting events, graduations and weddings. He enjoyed every minute he was around them as they grew up. Durl got to travel extensively; he visited all 50 states and 9 countries. He developed his wood-working skills and made gifts for family and friends including benches, high chairs, quilt stands, toys and more. Durl was the secretary for the Iowa Bakers Association for 20 years, participated on the advisory board for Indian Hills Community College and found time to volunteer with the Historical Society and Kiwanas where he was the Chairman of the Pancake Days for many years. He was an active member of the Knoxville Church of Christ and enjoyed picnics at Red Rocks Lake and game nights with close friends. In his 90s, he enjoyed time with his great-grandchildren. Durl will be remembered for his love of family, faith, sense of humor, kindness, creativity, patience and steadfast devotion. Survived by: children, Susan (John) Snowden, Roger (Maureen) Schletzbaum; six grandchildren; and six great grandchildren; brother, Jerry Schletzbaum, Redding, California; sister, Dorothy Schletzbaum, Atchison. As published in the Atchison Globe.